This post is a continuation of my post about how I cured my acne and started using Beauche products. 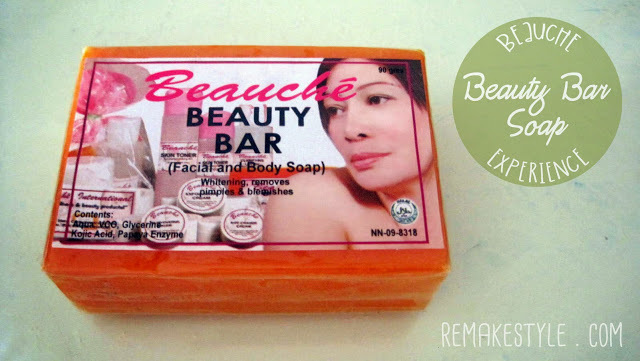 I changed my beauty regimen after having a bad headstart of using Beauche Beauty Bar Soap. Instead of stopping from using the acne soap, I bought the whole Beauche pack complete set. Use the Beauche Skin Toner to clean your face. Wash your face with Beauche Beauty Bar Soap. Lather it in your hand and massage on your wet face. Apply the Clarifying Lotion using upward stroke. Put Exfoliating Cream on your face. Note that this will sting. You apply it in front of a fan or AC to alleviate the pain. Do not rinse. Wait for about 15-20 mins. Apply the Rejuvenating Cream using circular motion. The Beauche Skin Toner is the one in pink solution. It has a sweet fragrance. It does not do much to the skin. This one is not as harsh as the other solution from Beauche. Unlike other toner, this one is applied before cleansing your face with the soap. I just finished the 60mL bottle that came with the pack. After that, I stopped using it. I think this one is hydrating but it didn’t really make any difference when I stopped using it. Beauche has two soap. The Gluta Soap in white, and the Beauty Bar Soap in orange. This is the one which is meant to remove pimples. The first time I used it, it really stung and made my face so red. After a few days of using it, the stinging subsided. It made my skin very dry. Moisturizing is really important. I used it for nine months and it really helped removing my pimples. This one feels harsh on the skin. This is supposed to remove sebum and eliminate dirt. If you were to ask me, I think this works like how a toner should work. It will sting on first application but will again subside after a few days of using. I suggest using it every other day. I finished one bottle of this and I stopped. This one is responsible for the peeling of my skin. The skin being peeled off my skin was really obvious. It looked like my face was just dried to those who do not know I’m using a peeling cream. This stung badly. It always stings when I use it. One should use it in front of an electric fan or AC to lessen the pain. This may be used once every week. Recommendation: Use this every Thursday if you plan on using it every week. The peeling will start Friday night (on my case), and will go on for three days at most. Do not use it if you don’t like being seen with a dry face. And do not use it if you use makeup everyday. Makeup looks really worst on a dry face. I wake up with a smooth face every morning after using at night. This is a moisturizer in all sense. I think this is responsible with the whitening of my face as well. I just hate it when my face looks oily. But other than that, this is a good product. I’d vouch for the following effects of Beauche above. Yes, I had a bad start of using Beauche. I had more pimples and I was not able to manage the dry skin I had. But that is just how the way it goes. Fortunately, Beauche worked for me. Still, some product line will work for others and might not on some. Here’s a full review of the Beauche Beauty Bar Soap. Have you tried Beauche before? Did it work for you? It took about 3 weeks to finally see the difference and about 3 months for my skin to really recover. 1 month n akong gumagamit bakit ang dami dami p din acne/pimples na lumalabas.. mawawala b tlg eto? o kelangan ko ng itigil ang application? plsssss helppp.. In my case it did. We have different skin types so this might be the case. If you already finished their pack (if you bought the whole set) and it did not work, then maybe you should stop. Try other products, something milder perhaps. what happens if you stop using it? will pimples appear again? In my case, no real bad case of pimple appeared again. You just have to find an alternative soap which could work on you again. hi! im using the product but i noticed dark spot on my face. is that normal or i need to stop using it? Hi Jas. That’s normal. Don’t worry. Just use it regularly. Of course it’s not normal. check if you have hydroquinone sensitivity. I think it would still be effective. Though I’m not using this one anymore once it cleared my face. I’m using Kojic now. Yung boyfriend ko ginagamit lang is yung toner and clarifying solution pero it really worked for him. Nakita ko talaga pagbabago ng mukha niya. Sobrang kinis ng face kaya naconvinced akong gumamit na din. Before gumagamit ako ng creams nila pero hindi nagwork sakin kaya kung anong ginagamit niya yun na din sakin. Pero it took him I think a year bago naging sobrang kinis ng mukha niya. Pero worth it naman yung tagal :) sana makatulong! hi how to remoVe the dark spot ? I’ve been using Sunflower Beauty Oil from Human Nature for some time now. Dark spots won’t go away easily, it would take time. Hi. That product can remove bumps? I used this specifically for pimples. I’m not sure if this would work on bumps but let me know if it will. Thank you. It took me 3 weeks to see the difference and 3 months to finally have those pimples subside. It worked on my case but ofcourse, we have different skin types. I told myself that if I finished the whole pack and this won’t work, then I will stop. You could try that challenge. Are you still using po? May hormonal acne ako, pero nung gumamit ako nawala naman po kaso super hapdi. I have a sensitive skin. Plan to use again kaso natatakot ako sa sakiy, til now po ba user ka pa din ng Beauche? Thanks po. Yes. Mahapdi talaga siya Tin. But my face got used to it after sometime. Setting aside sa exfoliating cream. I am not a user anymore. I stopped when I got rid of my pimple. I slowly shifted to other product. But honestly, I plan on using it again because of its whitening effect. We have different skin types so it might take longer in your case for it to really work. With regards to dark spots, it took me a lot of months for these to vanish. Hi po! I used beauche product from the past and stop and now im starting to use again. Im using the whole set po but i notice dark spots but not because of pimples it looks like it was burnt. Is it normal ? Ksi its been 6 days na po and still its there. At first it was reddish now its black. Will it still peel? Do i need to continue or stop? I did not experienced that so I’m not sure what that is. I’d suggest you still continue and give it another week. So overall, ano lang ang palagi mong ginagamit? I used the Soap and the Rejuvenating Cream most of the time. I let my skin rest from the other beauche products except for these. I don’t really like using Eskinol because I had some reactions to it. I used their rejuvenating cream for moisturizer when I was using it but now I am using Human Nature Sunflower Oil to moisturize my skin. Good review. Ask ko lang kung pano gamitin yung age eraser cream? Just put it in your face every morning after you take a bath and you’re way to go. Just continue using it. It’s just the way it works, and yeah, it hurts. Lalaki ako, and nag susuffer na kong moderate acne sa right cheek. Binabalak ko sana gumamit, pero di ako sure kung dapat ko bang i try yung whole set. Or just the soap kasi ang goal ko lang talaga ay mawala yung pimples. What would.u rec.? I recommend you use the whole set. The first time I used it, I used only the soap and the outcome was not good because probably I didn’t used moisturizer. (It was drying for your face.) Nevertheless, I bought the whole set and it worked for me. Hello sis ! Share ko lng experience ko din about sa Beauche products. I first buy a Beauche Set sa online website nila Beauché website. Nag Chat lng ako sa kanilang website and then. The Customer Service give me an advice about saaking skin problem. Dati kasi babad ako sa init at pansin ko na umiitim na ako. and so they guide me on how to care resolve my problem on my skin and they give a free advice. Grabe ayos yung customer service nila napaka professional at clear na clear nga information na sinasabi nya. Ito yung wala sa mga ibang website. So na convince ako na bumili ng products ng Beauché. I tried Beauché Set 750 pesos lng grabe free delivery ba sa bahay. Imagine 2 days lng nakuha na agad yung product. May fake ba ng beauce kc bumili po aq dito sa taiwan kaso parang iba yung level nya…ngbago nba kau ng packaging level ng product nyo? Hi Weng. I’m not a Beauche representative or in any way related to Beauche. I don’t even sell it. I am just blogging my experience about it and answering related questions based on my experience. Hi.. yung dr alvin’s ba na set products, is same with this one… i try dr alvin’s kase, pero hindi ko pa alam tong beauche, nung nabanggit ng sis-in-law ko, pinakita nya, then i try ..parang pareho lang sila.. is this the same, anyone use dr alvin’s set din ba???? kumikinis naman ung face ko, kaya lng , nagkaka pimples p rin ako..
Hi Dhebs. I’m not familiar with Dr. Alvin’s and I am not in any way affiliated with Beauche. Please contact your supplier for the info you need. Thank you. Dr Alvin’s is too harsh. Nagka allergy ako sa Kojic acid soap. Hi girl effective din kaya sya sa scar sa face? I had an impetigo kasi on my face red spot tlaga sya sa face ko . Magwowork kaya to? I guess when it comes to micropeeling, they do their job right. I’m not sure if they can fully eliminate your scar though. maam hndi pa ako nka try ng beauche gusto ko po sanang gumamit,subrang dami kc ng pimples ko ung pamumula sa face ko malapad na tapos my tumutubo na may nana at dumadami po ito,,guide nyo nman po ako kong anu ang gagawin ko. Hi Nene. My tips would be purely based on my experience. Just follow what I did in my blog. Not everyone has the same skin type so what worked for me may not work for you. But you should give something a try before you stop using it. 3 months would be ideal. 2years na ako na gumagamit ng beauche set at super effective sa akin… before ang dame kong pimples then napunta sa pekas so worried ako hanggang may isa akong friend ba recomend sa akin nito naka ubos lang aq ng isang set at nakita ko total effect tlaga kaya continue till now…. Ang kinis ng skin ko nun but when i started using some beauty products, nagkaroon na ako ng mild pimples. Now, 1 week na akong gumagamit ng soap, toner, rejuvenating cream pero may lumabas tuloy na acne. Is it normal? Hi Henry. In my case, I also had the same effect. Tinuloy ko lang. I gave it a try and used it for a month. The effect won’t show kasi agad immediately. But I used the whole set since the soap only was not effective on my first try. I use the toner and the clarifying solution. Works for me so far, but I still suffer from cystic acne. Since I’m on my 30s na, paisa isa na langcompare before when I was in high school, at mabilis matuyo thanks to the soap. Acne scars na lang ang problema ko, I guess I have to use the rejuvinating cream instead of the clarifying solution. FYI, the clarifying lotion and rejuvinating cream contains hydroquinone, which must be used on quarter intervals. Hi! This is a really good review on the product and you write very well. I love Beauche too. However, when the colder months come in, my face always worsens. Maybe, because I was using the exfoliating cream and clarifying solution everyday. In the end, I get dry, inflamed skin. I’ll try your recommendation to use the exfoliating cream once a week, starting today, Thursday; and the clarifying solution every other day. I’ve been using Beauche for 2 years. It’s the only brand that has also cured my acne and I loved how it makes my skin glows on the good days. I also experience everything you said in the initial stage. Recently, I stopped using Beauche because of these problems I had during the colder seasons. But, thank you for this honest post, I’ll try Beauche again and do the necessary adjustments. I do hope it works! HI, nagstart aq gumanit ng beauche product nung may 28 gngwa ko ung steps pero pag lagay ng ice inistop q kasi night shift aq sobra lamig kapag nilalagay ko sa mukha ko q pagod ung mata kaya un lang inistop q pero till ang dami ko pa din pimple maliliit tas my mga nana pa and then meron ung ung maliit na bukol buko prang allery, ganun ba tlaga reaction nun, kailangan ba iistop o ituloy pa din hnggng kelan mawawala ung pimples pag pinagpatuloy ko? I suggest you give it a month and ask yourself again if it made a difference. If it did, continue, if not, think if you want to give it another month or not. Hi Rose. I am not an expert on this and I am just sharing my experience. I’m not sure what caused your allergy but I did not have that kind of reaction. Maybe you should try other products instead if you think this triggered your allergy. Not all skin are the same after all. Use moisturizer. I used Nivea cream before but you can try other products too. Hello, i am using the soap and clarifying solution. It really hurts and i decided to use nivea cream as mosturizer, do you think it will be okay? I had the same experience. It hurts at first but as time passed, I got used to it. I used Nivea cream as my moisturizer din before. My suggestion is, based on my experience, let your face dry first before applying any product. Dry it with towel and give it some time because using the moisturizer. When do you think is the best time to use moisturizer while using Beauche set? The best time is always after using the soap. Make sure your face is 100% dry first before applying moisturizer. You mean its ok to use the toner after applying moisturizer? Because that the direction on using the set. After washing your face with soap apply toner.